This little guy just cracks me up, he looks like he thoroughly enjoys his job. I'm lovin' our new stencils and for this card I used the Sun Rays stencil and sponged on some yellow ink. Then I sponged on some light blue around the bottom portion. 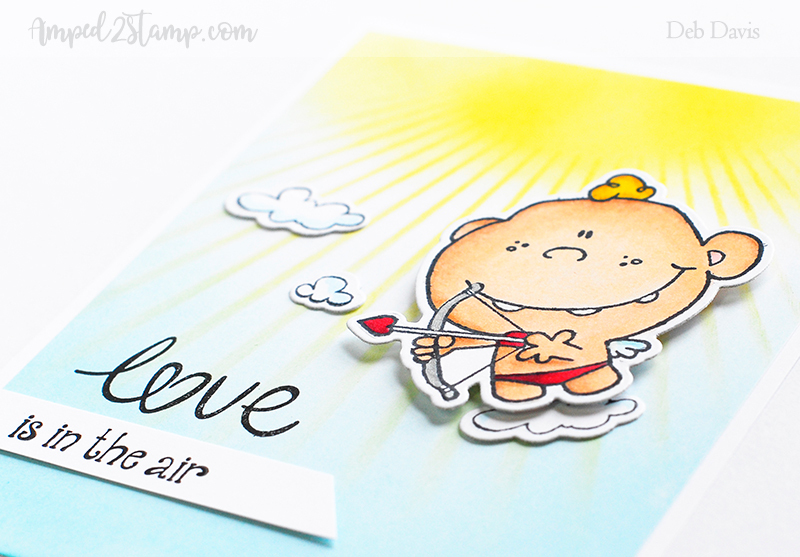 I stamped the Cute Cupid images with memento ink and colored them with Copic markers. Then I used the matching Cute Cupid die set to cut everything out. I stamped part of the sentiment onto some scrap white paper and cut it at an angle and glued it directly onto the card. I stamped the LOVE on the card and popped up the cupid with foam tape. Then matted everything onto a white card base. Hope you have a Happy Valentines Day <3! Would you like to make your own version of this project? You can SHOP NOW or click on the product images below for details about these and other stamps, dies and more available at the Whimsy Stamps store. And be sure to take advantage of this month's EXCLUSIVE 4x6 CAS (Customer Appreciation Stamp set) that you can get for FREE when you place an order of $75 or more! All content on this blog including text, images, concepts, and designs are ©Amped2Stamp. My artwork is for personal inspiration only and may not be copied for publication, contest submissions, and/or monetary gain. Please respect this copyright. Thank you. © 2015 NewAmped2Stamp. Felicity Template designed by Georgia Lou Studios All rights reserved.